Thanks so much to everyone who commented yesterday! Three Weddings and a Murder is now available at online stores. I am so grateful for the all the support! Our winner is Abigail Sharpe. Abigail please use the contact us form to email me your preferred email address and let me know what type of ebook format you prefer. You have won an ARC of FIRST DO NO EVIL, a copy of THREE WEDDINGS AND A MURDER, and your choice of a Barnes and Noble or Amazon gift card for $25! Please bear with me if it takes a day or two to get back to you- I’m traveling and getting married this week- but it won’t be more than a couple of days! Congrats! What’s up next: On Tuesday Sarah Andre interviews John Kwiatkowski from Houston’s scrappy, independent bookstore: Murder By The Book. 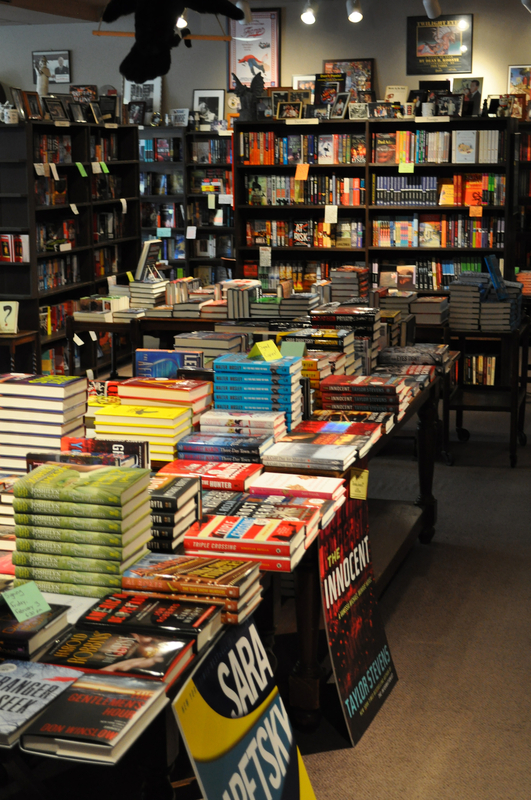 Discover some of the brilliant strategies cozy ma and pop bookstores are utilizing to take on the Amazon and e-pub Goliath. Commenters have a chance to win a $25 MBTB gift certificate that they can use instore or online. Posted on May 24, 2012, in Uncategorized. Bookmark the permalink. 3 Comments. Congratulations, Abigail, you are in for a treat! Last night I downloaded THREE WEDDINGS AND A MURDER and stayed up way past my bedtime reading it. It’s that good! Definitely 5-star material. Kudos to Tessa Dare, Leigh LaValle, Courtney Milan, and our own very special bride-to-be Carey Baldwin! Yay, Abigail! So happy for you! I’m sure you’ll love it.